For those who dream of tearing apart race cars, but may not ever have the chance, we have the video for you. 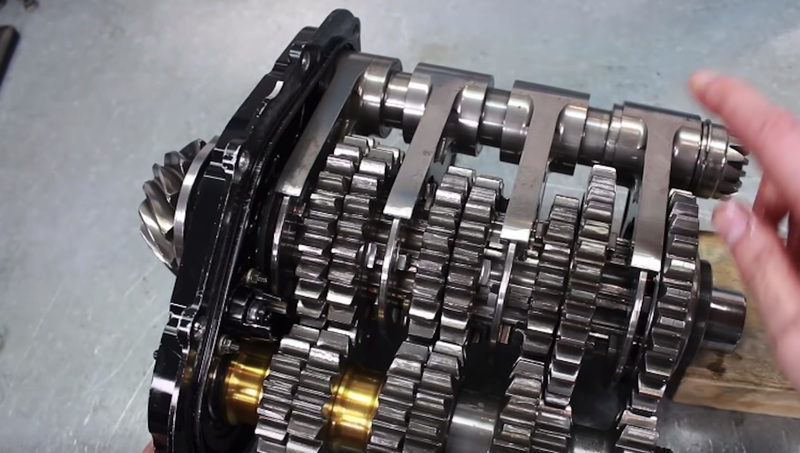 YouTuber Driver61 published a video last week that shows the teardown process of a Formula 1 car’s gearbox, and what’s inside to make the race car tick. Specifically, this is a transmission from a 1997 F1 car. Undoing the differential casing reveals the transmission casing in all its glory. Right away, we see the main shaft gear that comes out of the top of the transmission. The main gear drives two additional gears in the diff casing, a diff gear, and then eventually propels the driveshaft which sees power finally make its way to the wheels. The video also digs into the gearbox oil tank, which collects oil flicked off from the diff gear. The oil tank then distributes the oil through the rest of the transmission. Finally, we get to the gears themselves. Inside the transmission case is the lay shaft, the component the engine actually powers to turn the main shaft. This transmission sports seven gears, and a change cylinder is the mechanism that actually shifts the gears. The change cylinder works the barrel and a selector shaft moves a fork to pick out the gear the driver selects. This then turns the main shaft to send the power to the diff and finally to the wheels. The precision is staggering as the fork selects a gear and moves through neutral positions. Remember, these changes aren’t happening slowly. Drivers are flicking through gears at incredibly high speeds. Have a look at the internals for yourself above.